Some days, even vegans don’t want to cook. Some days even vegans have terrible cravings for pizza. It’s not a crime to want to order in some “fast food” every so often, and I find that you can make your hungry omnivorous dinner companions happy if you suggest ordering pizza. But what does that mean for a vegan? 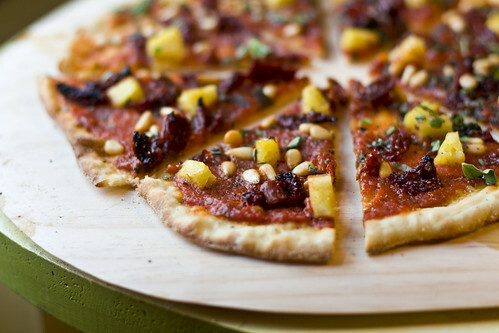 Do vegans have to sacrifice taste to continue eating ethically at pizza places? Sometimes they do. But I have discovered a way to make “Pizza Pizza” pizza vegan and equally if not more delicious than its dairy-laden counterparts. And here’s how to do it. So next time you are ordering pizza, when it comes to taste, don’t just settle for “good enough”, go for “absolutely delicious to the extent that even your omnivore friends would agree”. Does the Pizza Pizza pizza look anything like the one in the picture? Creepy. I just order this exact pizza pizza pizza last night. My only changes – extra sauce on top and grilled zucchini instead of pineapple. but I almost got the pineapple instead, for real. We are pizza pizza pizza twins. Neil and got one last night a pizza-booze-telly night. It was pretty awesome – great combo of flavours. Loved the sweetness, richness, plus that little kick of spice. I will say that it most likely to appeal to the less-is-more types. I tend to like my pizzas with every (vegan) thing I can think of piled on. My rule of thumb is that if there is any topping that is not overlapping some other topping, something is very wrong. I haven’t ordered from Pizza Pizza in a long time. I don’t consume honey, so that leaves the white crust, which is why I don’t order all that often. One thing I learned was to NEVER order the spinach. I did once, and there was like six tiny spinach leaves set on my pizza. NOT WORTH IT. I used to enjoy the artichokes but I think they discontinued them. Pizza Pizza is really amazing for the number of toppings they offer though. Here’s another SUPER tasty vegan pizza option for us Ottawans. Order a vegetarian pizza from Pavarazzi’s (Artichoke hearts, olives, roasted peppers, tomatoes, sesame seeds) with the herb crust and the spicy sauce.